The holidays are here and looking for something relaxing to do amid the madness is at the top of every person’s list. There are literally dozens of events happening in your city, neighborhood, block, heck, even in a few things to do in the comfort of your own home. We'd like to suggest a few things - with a Latino flair of course - which you can do with your family or just a few friends. And by the way, they won't break the bank. In what many consider to be the most anticipated film of 2015, Guatemalan-born Oscar Isaac stars as Poe Dameron, a new character in the Star Wars universe that will be getting a surfeit of screen time in the upcoming sequels. Isaac joins the return of Harrison Ford, Mark Hamill and Carrie Fisher in the continuation of “The Return of the Jedi”. Also watch our interview with Oscar Isaac on our Pop Latino section! Coming off of Oscar awards for Best Picture and Best Director for “Birdman,” Mexican director Alejandro González Iñárritu is undoubtedly one of the most accomplished Latinos in Hollywood film history. His new movie, “The Revenant” is a visual tour de force that will most likely land him once again several Oscar awards, including Best Actor for Leonardo DiCaprio. This punishing look at one man’s journey for revenge in the American wilderness is a stunning cinematic work that will have you amazed from the opening frame. Dominican actress Dascha Polanco and Venezuelan actor Edgar Ramirez pop off the screen in “Joy,” the new inspirational film from David O. Russell. Polanco and Ramirez play best friend and husband respectively to Jennifer Lawrence’s Joy Mangano, a divorced mother of three children who built a business empire after devising a multi-million dollar idea which we know today as the Miracle Mop. Between Lawrence speaking many lines in Spanish and Ramirez singing in Spanish, “Joy’s” Latino factor is a welcome surprise. Take a look at our interview with Dascha Polanco! One of the characters in Quentin Tarantino’s new whodunnit comedic western is a Mexican criminal called Bob "The Mexican” played by Mexican actor and Oscar nominee Demián Bichir. He has some very funny lines in the movie, but it is ultimately the script that is the biggest attraction. Eight bounty hunters and one prisoner find shelter in a lodge during a blizzard, but will any of them have the shrewdness to make it out alive? With a heavyweight cast of magnificent actors and dialogue that will make you choke on your popcorn, this three-hour-film is one of the more memorable movies of 2015. What reasons can one possibly give about going to see a Marc Anthony that have not already been said? A Marc Anthony concert is “electric,” “intense,” “hypnotic” and above all, an experience you’ll never forget. What sets him apart from the rest of his salsa counterparts is the ferocity behind his powerful voice. He seems to experience every song deeply, animalistically and almost religiously. No other salsero can rival him in voice or performance, and that is why if you haven’t seen Marc Anthony in concert yet, this is your chance! Considered the greatest male singer of his generation, “El Sol de Mexico” packs a concert with massive hits. They are not just chart-topping singles, they are classics which have shaped our youth in one way or another. Luis Miguel in some degree is our best friend, one who has been there witnessing the first kiss to our first heartbreak. Seeing him in concert is a reunion that is long overdue. You’ll feel the sun shining on you on the hit “Cuando Calienta El Sol” and bop in your seat on the Jackson 5 cover “Será Que No Me Amas,” but it's his ballads where he becomes a teen idol all over again. Melodies such as “La Incondicional” will leave you transfixed. Son of the Mexican icon of icons, Vicente Fernández, Alejandro has become one of his country's biggest international superstars. His rancheras have the heart of Mexico behind them, but his pop songs possess a seductive and sultry aura that makes the ladies swoon. As of late, Fernández has been touring with friends Marc Anthony and Marco Antonio Solís, but this time around, he’s going solo and in an arena near you. They are one of the more vivacious live shows around. 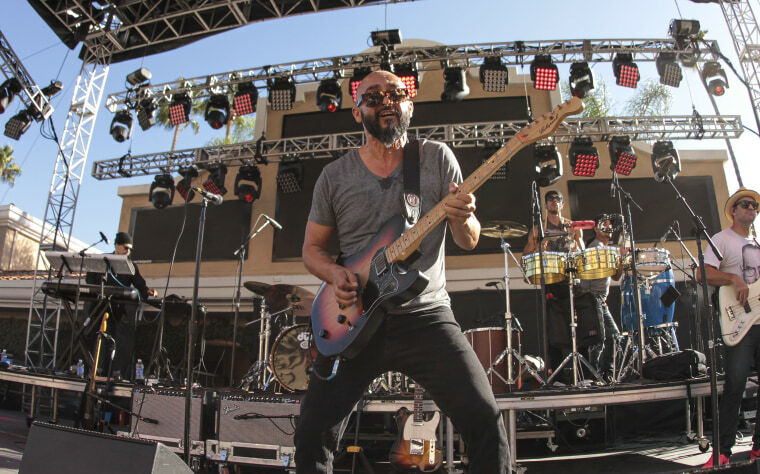 The L.A formed band Ozomatli infuses any venue with a melting pot of sounds such as salsa, merengue, hip-hop and jazz-funk. Songs like “Dos Cosas Ciertas” and “(Who Discovered) America” are just a taste of the euphoria you’ll experience as soon as they hit the stage. Spanish language period pieces are all the rage right now on Netflix, and Spain’s “Velvet” is one of its best examples. This is the Hispanic version of “Mad Men,” but set in a prestigious 1950’s department store called “Galerías Velvet”. This love story of class divisions melds stunning high fashion with infidelity, betrayal, company politics, saucy and humorous story lines and unrequited love, resulting in an addictive 29 episodes that will lock you to your sofa for a few weeks! With English subtitles available. This is “Downton Abbey” in Spanish. This opulent and beautiful production from Spain revolves around Julio whose sister has vanished from el “Gran Hotel”. What happened to her? Our hero infiltrates the hotel and poses as a waiter to investigate her disappearance, but an unexpected love affair with the owner’s daughter sees a complicated situation get even worse. There are three seasons of pure suspense, intrigue, eye-catching costumes and clever twists that you’ll be asking for season four and five in no time. What better way to say goodbye to 2015 than to spend it with “Mr. 305” as he returns for his second New Year’s Eve special kicking off 2016 in style live from Miami? This time around he will be joined with performances from Shawn Mendes, Prince Royce, Austin Mahone, Pia Mia, R. City, Jussie Smollett and many more.